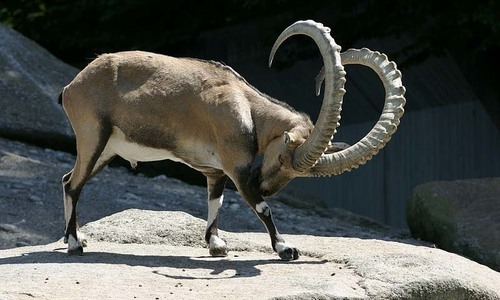 GILGIT: Senator Talha Mahmood claimed to set a record by hunting an ibex with 54 inches horns in Passu valley of Hunza district here on Tuesday. The lawmaker, who was accompanied by a local guide in the expedition, told reporters that Gilgit-Baltistan had the largest wildlife habitat in Asia and therefore, it could attract foreigners in large numbers for lawful hunting. 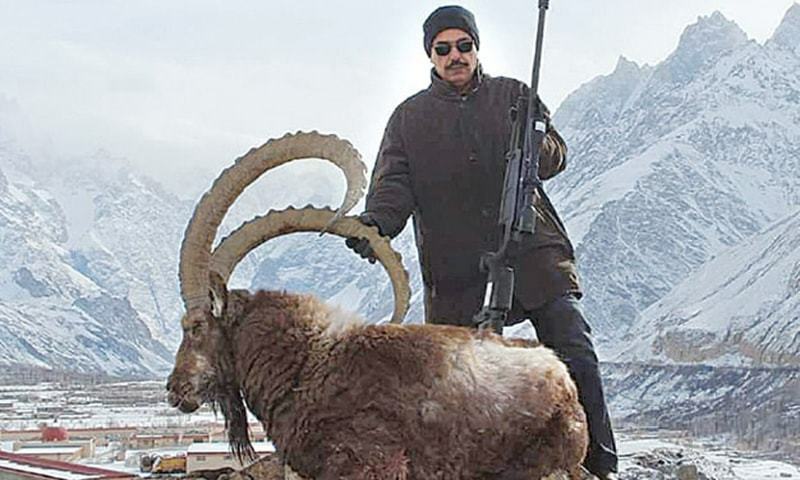 The wildlife department officials said Senator Talha had obtained the trophy hunting licence by paying the permit fee to the GB government for hunting ibex. They said the lawmaker had been hunting animals in GB for the five years. GB conservator (wildlife and parks) Yaqoob Ali Khan said more than 40 wildlife species had so far been hunted in the region under the 2018-19 trophy hunting programme. He said people from within the country and the US and Europe got hunting permits. The official said the wildlife department had auctioned the hunting licence in Oct last year under the 2018-19 trophy hunting programme. He said the wildlife department was doing its best to check illegal hunting across the region despite being short staffed. Meanwhile, the police arrested a man for illegally hunting an ibex in Passu valley of Hunza. So our senators have the money and spare time to do this. Good. No problem if it's hunting for food. But for sports, should not be endorsed. Killing such animals will affect the gene pool. Future generations will be smaller. One day there will not be remain ibex for hunting.. Hunting & killing should not be promoted, rather anasthesia dart should be used to dart the animal, the person take the pic and the animal life is spared. Is he setting example of bravery. Killing poor animal which did not pose any threat. Sad to learn that such people are our lawmakers. What is he proud of ?? I wish and pray this man comes face to face with a very angry ibex without his gun. Let's have nature takes its course then. Shame on him. @Shahid, 1500 meters? most hunters cannot shoot accurately beyond 300 meters. you have never hunted, this much is obvious. Hunting for sport...is the worst kind of hunting. @Haider , he can shoot a goat for food, not an ibex. hunting for trophies should.be made illegal. Leave those beautiful animals alone !!!!!! Kililng for sport must never be accepted !!!! Shame on the minister for killing this precious and beautiful ibex. These animals and other wildlife should be preserved and enjoyed shooting with camera lens rather than powerful guns. @fairplay, if the ability of shooting from long distance is important just provide a moving dart board to him and show his skills! Why you need a IBex for that? Certain animals need to be culled. The licence fees are massive, especially for foreign hunters. These make up a large amount of the funds needed by the wildlife staff. Shame on those who hunt this endangered species. A very sad state of affairs, this unfortunate country is faced with where this egoistic hunter supposedly a lawmaker is involved in this controversial activity. Shame on those who provide assistance in form of hunting permits and guide service. It is about time that we protect these beautiful animal in Chilean range near Quetta and in Passu Valley Hunza from these poachers, before these become extinct. ANYBODY LISTENING? Mr senator you play for fun and poor animal die for nothing. Very cruel indeed. Illiteracy of politicians has damaged Pakistan beyond repair. They have destroyed the country, destroyed the nature. Dont u want your future generations to have a glimpse of these marvelous animals Mr Lawmaker Sahib....some killed legally some illegally and none shall remain...there is still time...mend your ways!!! Sad instead protecting lives of animals we are selling licence to keep kill. No remorse. The government and bureaucrats should hang their heads in shame. Keep animal alive as you are your family wants too, they are the beauty of the wilderness, I born in a family who love hunting , I decided to preserve them , never proud or impress by any one doing so.today I carry Camera instead of Gun. Overwhelming disapproval of "hunting for sport" by readers is encouraging sign.